The Baltimore Office is a shortened version of the Divine Office that was specifically recommended for the laity by the American bishops in 1888. Like the better-known Baltimore Catechism, it gets its name from the Third Plenary Council of Baltimore (1884), under whose authority it was published. Simplified versions of the Divine Office have been among the laity’s favorite devotions for centuries—and in fact “Books of Hours”, based on the Little Office of Our Lady, are the most common type of medieval books that have survived to today. So the idea has a long historical pedigree. These were all rendered in traditional “Prayer Book” English, with Vespers printed bilingually to facilitate the laity’s attendance of public Vespers in churches. Moreover, as they were produced prior to 1911, they precede all the 20th century overhauls of the Roman Office by Pius X and Paul VI. Thus, they occupy a unique position as faithful American variations of a Roman liturgical tradition going all the way back to St. Benedict in the 6th century. 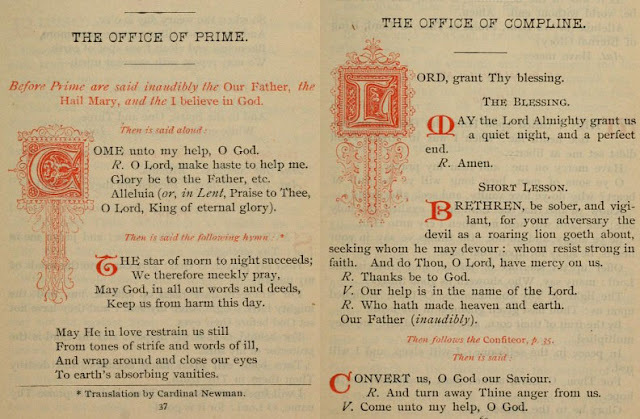 Prime and Compline form the morning and evening bookends of the Baltimore Office, and were particularly suitable for that task because they do not naturally vary much day to day. Compline in the Roman Rite has a fixed set of psalms used throughout the week—4, 30, 90, and 133, and only the concluding Antiphons of the Blessed Virgin vary according to the season. It is printed entire in the Manual. Prime traditionally had some daily variability in its Psalms, which the Baltimore Office eliminates by omitting the middle Psalm (117, 23, 24, 25, 22, 21 or 118 depending on the day of the week) and retaining only the first and last psalms, 53 and part of 118, which are invariant. The Baltimore Office of Prime does, however, faithfully reproduce that office’s traditional Sunday distinctives, namely the Athanasian Creed (Quicumque vult). Matins and Lauds could, of course, have been used for morning prayer as well—after all, Thomas Cranmer used material from them for morning devotions in the Anglican Book of Common Prayer, whose success the American bishops were trying to counter. Yet without the same kind of extensive Cranmerian cutting and pasting, Roman Matins and Lauds are not as obviously suitable for lay use. They are much more complex and variable in their systems of Psalms, Lessons, Responsories, and Antiphons—not only throughout the week but through different feasts and seasons. Traditional Matins, moreover, is quite long, with a dozen or more Psalms. To include these would have pushed morning prayer beyond the reach of the average layman. Nonetheless, by looking beyond the full Roman Office to the Little Office of the Blessed Virgin Mary—whose roots at Cassino are almost as old as the Office itself—we can find plenty of models for a reduced Matins that could serve as an expansion of the Baltimore original. For example, I am currently fleshing out a year-round version of Matins , where the fixed (non-Proper) parts of these offices can be pulled straight from the Office of the Dead, and the Psalms can vary according to the season of the year. 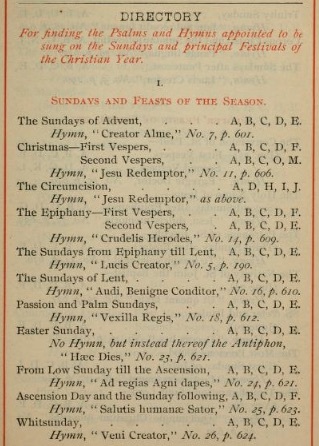 The variable Psalms draw from a schema "for the various seasons" that the Manual had already drawn up on page 219 (see below). 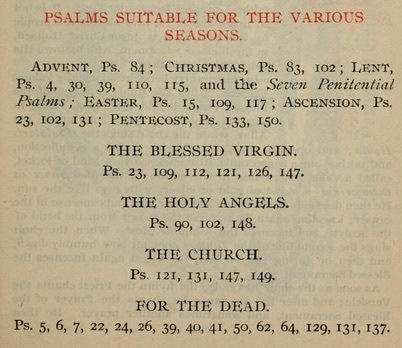 A similar list of Psalms suitable for various occasions could even be used for Votive Offices. In an era when parishes are closing all around us and many of us are driving an hour or more to Mass every Sunday, it is increasingly crucial for all of us to live the liturgical year at home. Saying the traditional Office in all its fullness and complexity is unquestionably the most truly liturgical way to do that, but not everyone can. Fortunately, the Baltimore Office offers an excellent and fully traditional alternative that requires no Latin and no previous instruction. and let my cry come unto Thee!